Nowadays we are observing that the far-right political parties and nationalists are having an increasingly stronger presence. The experts and analysts are also commenting on this a lot and believe that this is all happening because the left-wing parties are not strict enough in their policies on immigration. They also cite various other reasons for this, but ultimately all of these issues boil down to banning Muslims from entering their countries. They claim that Muslims do not make an effort to integrate into their society and that they can only live in their countries if Muslims forgo their religious practises and customs and adopt their values and tradition. If they do not give up their teachings then that means that they do not want to integrate into the society. They believe that by constructing minarets, wearing the Hijab and not shaking hands with the opposite gender is a threat to their way of life. They believe that the religion of Islam poses a serious threat to them and they try to prove this claim by citing the current state of certain Muslim countries where terrorism and lawlessness is rampant. Although most of the things they claim are purely out of their opposition to Islam, but unfortunately they are right in regards to citing the example of the current state of the Muslim countries and the acts of terrorism carried out by the Muslims even though these rebel groups are being supported by the Western powers. It is unfortunate that whenever Muslims have incurred any loss it is because of their own ill-practises and by overlooking the true teachings of Islam. Instead of improving their spiritual conditions and following the instructions of the Holy Prophet (sa), they have given preference to their greed for the worldly pleasures. The Ulema [scholars] have further misled the Muslims because instead of accepting the person regarding whom the Holy Prophetsa had prophesied that he shall appear in the latter days and will once again revive the faith of the Muslims, they have grown in their opposition against him. For instance, in Algeria, there is intense opposition against the Jama ‘at and Ahmadis have been put into jail simply because they have accepted the Imam of the age. There are over two hundred Ahmadis who are currently jail or in police custody but despite the cruelties perpetrated against them they are firm in their faith. However, the perpetrators should remember that Allah the Almighty is watching their injustices and cruelties and He is listening to the prayers of those being oppressed and when He declares His judgment then these people will face ruin in this world and in the hereafter. These people should ponder over the current state of Islam wherein all kinds of objections and allegations are levelled against it. Does Islam not have powerful arguments and proofs to establish the superiority if its teachings? Do they think that Islam will only spread by killing people of other faiths? If that is what they believe, as is evident from the practise of the Ulema, then these people are rejecting the commandments of the Allah the Almighty and the Holy Prophet (sa). The current state of the Muslims is extremely dire. On the one hand, there is the so-called Ulema and extremist organisations who seek to create disorder in the name of Islam. On the other hand, we have those Muslims who have drifted away from their own teachings or have come under the influence of the West and have become fearful to express the beautiful teachings of Islam. Instead, they simply agree to whatever the worldly people say, or give a completely wrong interpretation of the Islamic teachings in order to please others. Thus, the Muslims who reject the one who has been sent by Allah the Almighty are in fact rejecting the commandment of Allah the Almighty and His Prophet (sa). Call unto the way of thy Lord with wisdom and goodly exhortation and argue with them in a way that is best. Thus, one should use sound and convincing arguments in order to demonstrate the true and beautiful teachings of Islam instead of raising the sword like the so-called Ulema [scholars] and as other extremists do. Nowhere has Allah the Almighty said to spread Islam in this manner. Certain ill-practices which religion deems to be unlawful and sinful acts are becoming widespread in some of the developed countries and the laws of the land also protect them. If the concerned party is going to take offence and become angry at what we have to say regarding those practises then we can temporarily avoid speaking against it and simply walk away by conveying the greeting of peace as that will be the most wise act to do at the time. However, if someone were to become fearful of them or come under their influence and agree with what they say then this is something completely wrong and such a person will be partaking in that sin. The Promised Messiah (as) states that ‘and argue with them in a way that is best’ does not mean to show weakness in faith, rather to convey the true teaching without causing any disorder. Thus, a Momin [believer] should be aware of the difference between showing cowardice and wisdom. The practices that Islam deems to be unlawful must clearly be declared as unlawful but at the same time we must not take the law into our own hands and create disorder. Further expounding on this, the Promised Messiah (as) states that the ignorant Maulvis [Muslim clerics] think that Jihad means to spread Islam by the sword. This is a completely erroneous concept and the Holy Quran cannot be made blameworthy for their wrong actions. Allah the Almighty commanded the Holy Prophet (sa) to show more patience than the collective patience of all the previous messengers. He was told that there is no compulsion in religion and that he should call people to the way of his Lord with wisdom and goodly exhortation. Allah the Almighty also told him to supress his anger and forgive those who perpetrated cruelties and injustices against him. Thus, how can such a God give a teaching wherein it states that the disbelievers should be killed? The other Muslims do not practise the true teachings of Islam because either they do not have the desire to spread the message of Islam, or as the Promised Messiah stated that this idea has taken root because of the foolish and ignorant Maulvis. However, we must promote the true message of Islam to Muslims and non-Muslims alike. Every Ahmadi must pay special attention towards this. Those Muslim groups who once only harboured such extremist views in their hearts have now started to openly practise their cruelties. In such circumstances, the responsibilities of an Ahamdi have significantly increased. The Promised Messiahas further states that that a person who is harsh and enraged, cannot utter wise and meaningful words from his tongue. The heart that flies into a rage and quickly gets out control is deprived of sage matters. This is precisely what we see in the Maulvis when they oppose us. And so, when Ahmadis propagate the true and peaceful teachings of Islam to the world, then the opponents of Islam always say that though you preach this message but the other Muslims do not consider you as Muslims therefore how can you be considered as the representatives of Islam? Therefore, in these circumstances, every Ahmadi must realise that their responsibilities have significantly increased. The wisdom of Hazrat Ali (ra) should be kept in mind when preaching. He stated that at times the heart is willing and inclined towards listening to something while on other occasions it is not. Therefore, one should enter into the hearts of people while taking this into consideration and should assess the situation and whether the person is willing to listen to what you wish to say. Thus, we also need to adopt this wisdom. The Promised Messiah (as) also guided the Jama’at in this regard and said that a person should ponder over what they wish to say and keep it concise. Delving into long debates and deep discussion has no benefit. One should convey his point in a few words which goes straight into the ear and if ever the opportunity arises in the future then he can expound upon it. However, this is only possible when one is constantly in contact with them. Those who oppose faith, seek to challenge the laws of God and in the name of freedom are trying to portray their ill-practises as moral. However, we must respond to them with wisdom and by remaining constantly in contact with them. Nowadays, the opposition towards Islam has reached to such an extent that in Australia there are certain people who say that Muslims who do not shake hands with the opposite gender should be expelled from the country. However, Ahmadis must respond to this with wisdom. Similarly, in other countries similar sentiments are expressed. In fact, in Holland, a politician stated that all the Muslims should be expelled or all the Muslims belonging to a particular country. The President of USA also wants to ban Muslims of certain countries. Huzoor (aba) stated that although the anti-Islamic movements are behind all of this and some Muslims groups are assisting them, however, the majority of the people are unaware of the true teachings of Islam. Huzoor (aba) instructed all those Jamaats that have a substantial amount of members, to organise programs that display the peaceful teachings and message of Islam in a manner that will leave a lasting impression. It is only the Ahmadiyya Community that can arrange these events in an organised manner, as this task has been assigned for those who have followed the Promised Messiah (as). Huzoor (aba) then quoted an extract of the Promised Messiah (as) in which he stated that ‘no matter how fiercely falsehood opposes the truth, it is the absolute truth that will always reign supreme.’ Huzoor (aba) stated that wherever Ahmadis face opposition, we witness that this gives us an opportunity to introduce the Jamaat. In Algeria, even our efforts to spread the message of Ahmadiyyat and introduce the Promised Messiah (as) may not have given us exposure to the same degree as these [court] trial and lawsuits have. Similarly in Non-Muslim countries, wherever there is a wave of Anti-Islamic sentiments, the Jamaat should do more to highlight the peaceful message of Islam. May God Almighty grant us the opportunity to live our lives according to this and may we become examples of true Muslims. 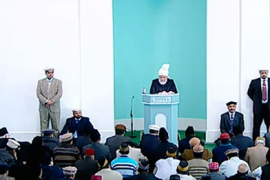 Huzoor (aba) then announced that after the prayers he would lead some funeral prayers in absentia. The first funeral prayer was of Maulana Hakeem Muhammad Din Sahib of Qadian, who was the son of Mr Aziz-ud-Din Sahib. He passed away on 15th March 2017 at the age of 97. ‘To Allah we belong and to Him shall we return.’ His paternal grandfather was Hazrat Hakeem Maulvi Vazeer-ul-Din Sahib, who was part of the 313 companions mentioned by the Promised Messiah (as) in the books: Aina Kamalaat-e-Islam and the appendix of Anjaam-e-Atham. His paternal grandfather was the headmaster of a school in Kangra which was miraculously unaffected by the Kangra earthquake of 1905 – which was earlier prophesied by the Promised Messiah (as). Hakeem Muhammad Din sahib was born in 1920 in Mukerian, which is situated in the district of Hoshiarpur. He completed his early education in Qadian and obtained a Munshi Faazal Degree [higher level of education prior to university] and thereafter went on to study medicine. From 1939 to 1944 he served in the department of railways as the assistant station master. Under the life devotee scheme launched by Hazrat Musleh Maud (ra), Hakeem Sahib also submitted his application to devote his life in 1943, however, he was advised by Hazrat Musleh Maud (ra) to continue with the line of work he was then working in. Eventually Hazrat Musleh Maud (ra) accepted his request and assigned him as the missionary in charge of Bombay. Overall he had the opportunity to serve for 25 years in various capacities. In 1972 he returned to Qadian and was initially assigned as a teacher in Madrasat-ul-Ahmadiyya, after which he served for twelve years as the headmaster of Madrasat-ul-Ahmadiyya. He served in various other capacities as the head of the Qaza board, Sadr [head] Majlis Ansarullah of India, member and then later Sadr [head] of Majlis Karpurdaz. He was also made Nazim [In charge] Waqf-e-Jadid and from 2011 to 2014 he had the opportunity to serve as Sadr of Sadr Anjuman Ahmadiyya. He also had the opportunity to perform Hajj. He was a selfless person who served in various capacities with the utmost humility. May Allah the Almighty elevate his status and enable his children to serve the Jamaat with loyalty and sincerity. The second funeral prayer is of Fazal Ilahi Anwari Sahib, who was the son of Master Imam Ali Sahib. He passed away in Germany on 4th March 2017 at the age of 90. He was born in Bhera on 16th April 1927. In 1946 he passed his FSc examination from Ta’leem-ul-Islam College in Qadian. In 1947 he devoted his life and after that he obtained his BSc from Government College Lahore in 1950. In 1951 he gained admission into Jamiat-ul-Mubashireen [a five year course to train missionaries]. In 1956 he was sent as a missionary to Ghana where he served until 1960. Between 1960 to 1964 he served as a teacher in Jamia Ahmadiyya Rabwah. From 1964 to 1967 he served as the missionary for West Germany and in 1968 he was sent to Nigeria, where he stayed until 1972. In 1972 he returned again to Germany and remained there until 1977. In 1982 he was sent as a missionary to the Gambia. In 1983 he was transferred to Nigeria and served there until 1986, after which he was assigned as a teacher in Jamia Ahmadiyya Rabwah until 1988. He eventually retired in 1988 and moved to Germany. During the disturbances of 1974 he assisted the Jamaat greatly by arranging the immigration for many Ahmadis. May Allah the Almighty elevate the status of the deceased and enable his progeny to continue his virtuous deeds. The third funeral prayer will be of Ibrahim bin Abdullah Ugzul Sahib, who was the father of Jamal Ugzul Sahib of Morocco. He passed away on 10th March 2017 at the age of 81. To Allah we belong and to Him shall we return. He performed the Bai’at [oath of initiation] in the year 2000. His wife accepted Ahmadiyyat before him and was the one who encouraged him to perform the Bai’at. He would watch MTA regularly. He was regular in his five daily prayers and had a special love of the Holy Quran. He was kind hearted towards all his family and he kept his extended family united. Hospitality was one of his special attributes and he would always welcome guests of the fellow Jamaat members happily. He was known for his honesty even from an early age. When he was in employment in his youth days, the owner would entrust him with all the trading goods and capital, to the amazement of co-workers. In his last few days during the period of his illness he would continuously enquire about the prayers. May Allah the Almighty elevate the status of the deceased and grant steadfastness to all those who survived him, and enable them to remain attached to Khilafat.